Below: Marriage is hard, but it might be easier if we know a bit before getting married. 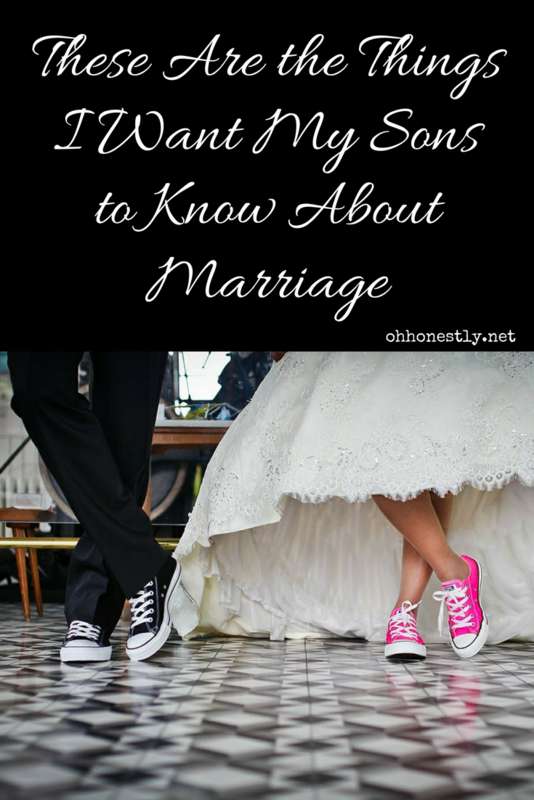 Here’s what I want my sons to know about marriage. You are young right now, only 9 and 7, but I know how fast time goes, and before we know it, you’ll be standing in the front of a church, waiting for your bride to walk down the aisle. Daddy and I have been married 11 years, which may sound like a lot to you, but in reality is a drop in the bucket. Maybe if I were to wait another 10 years to write this I would have entirely different things to say. 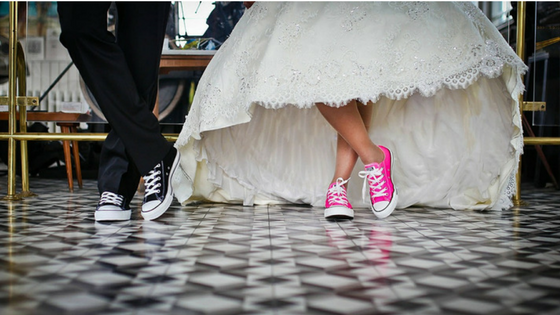 Even so, right now, this is what I want you to know about marriage. I know that you can’t make your wife feel a certain way, but your actions certainly affect her. One of the greatest ways for you to show that you value and love her is to help her feel secure. Physically, that means that she feels safe with you. She knows you would never hurt her and she knows that if she was in danger from an outside force you would rush to her defense. She knows that you work hard to provide for her physical needs. Whether you bring in the majority of the family finances or not, you always strive to make sure your family is taken care of. Emotionally, it means that you are a safe place to land. When she’s excited about something, you share her excitement. When she’s upset about something, you listen without judgement. The things she tells you in confidence remain in confidence because you hold her trust sacred. She knows you don’t talk negatively about her with your friends, family, or coworkers. Spiritually, she sees your commitment. You live your life for Someone greater than you, her, or your kids. For me, there is great security in knowing that your dad lives with integrity and desires to make every decision one that lines up with Biblical principles. It’s also a relief to have him lead our family in such an important area. I know there are many wives who shoulder the responsibility of teaching their children about their faith, and I appreciate that your dad bares that responsibility too. Neither your dad or I are big talkers. You might think that means we’re on similar wavelengths when it comes to communicating. You would be wrong. After almost 12 years of marriage, we can still be pretty bad at communicating. Sometimes it’s just a simple lack. He thinks he told me something but didn’t, or I only give a partial explanation to something of which he needs all the details. Other times it’s the bigger issue of how we’ve learned to deal with things over the years. I tend to shut down when I’m mad, leaving him guessing at what my problem is. He tends to shut down when he’s stressed, leaving me with the same issue. It’s gotten easier over the years, as we’ve learned each others quirks, but the earlier you pay attention and learn to read your wife’s signals, the better off you’ll be. It’ll probably mean communicating in a way that’s uncomfortable for you at times, but I’ve found that when I’m willing to take an uncomfortable step, it almost always ends up better than I hoped. Of everyone in the world, I care most about what your dad thinks of me, so a carelessly spoken sentence from his mouth hurts me far more than a thoughtless word from someone else. Conversely, a simple word of encouragement from him has a huge impact too. 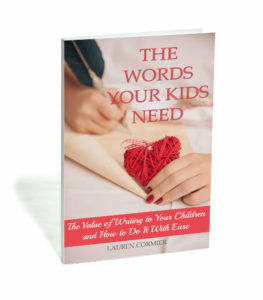 Your words can shift the entire trajectory of your wife’s day. I remember one night several years ago, I was mad about something silly. We’d put you to bed and I was stomping around the kitchen, rage cleaning. Your dad called from the living room, “Hey Hon,” and I braced myself for him to get after me about my attitude. Instead he simply said, “I love you.” My anger fizzled. My shoulders relaxed. My rage cleaning ceased. Our evening was saved from a night of stony silence because your dad was willing to overlook my faults and remind me of his love. Guard your words with diligence. Practice holding your tongue when you’re angry or frustrated. Once something is said, even if you don’t really mean it, it can never be taken back. On the other hand, be free with your compliments. When you think the house looks extra clean, tell her. When you see how hard she works, tell her. When you notice how beautiful she is, tell her. Those words will be planted deep in her heart and they’ll reap great rewards. You know how I feel about writing letters to you guys and your sister. 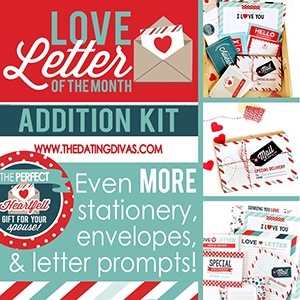 It’s just as important to write them to your spouse! The kit below makes it super easy. Oh, she’ll look similar to the girl you married and she’ll go by the same name, but she won’t be the same person. It’s good advice. If there are parts of your girlfriend’s personality that you can’t live with, it’s foolish to think you’ll be able to change those things once you’re married. That said, it’s foolish to think that she’ll never change. The person I am today is not the same person I was when your dad and I got married. Time has changed me. Marriage has changed me. Motherhood has changed me. The same thing will happen to your wife. It will happen to you too. The two of you will discover new interests, new talents, new friends. You’ll realize that things that are important to you now will no longer be important to you then and vice versa. It’s a scary prospect, isn’t it? Knowing that the person you’ve committed your life to will change and you have no control over it? I’d be willing to bet that a good portion of divorces are a result of this very thing. Yes, change can be scary, but if you know to expect it, you can think of it as an adventure. You’ll get to fall in love with a new version of your wife over and over again. Okay, I know I just used the expression “fall in love,” but hear me out. You do not fall in love like you fall into bed at night. You do not fall out of love like you fall off a bike. Love is not a thing, like a bed or a bike. Saying you fall in love or fall out of love cheapens love. It turns it into something that you have no control over. Love is a choice. It’s an action. It is daily deciding to put another person’s needs and desires above your own. 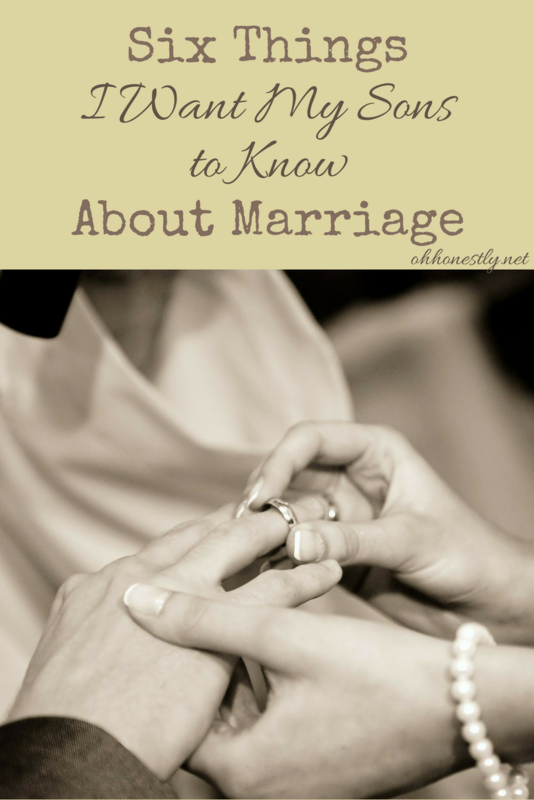 I know that sounds harsh, but marriage is a serious covenant relationship and I want you to be prepared for it. I highly recommend that you don’t allow yourself to wake up one day to the realization that you don’t love your wife anymore. How do you do this? By paying attention and by not letting your feelings dictate your actions. Even when you don’t feel loving towards your wife, act loving towards her. Feelings follow actions. Somehow (I blame Jerry Maguire) our society has fallen for the lie that our spouse should complete us. Then when they don’t, we move on to another person who seems to fill us up a little more. We think we’ve found the answer… until we realize that they don’t fulfill us either. Your wife will never fulfill you. She will never meet all your expectations. What she will do is annoy you a lot. She’ll mess up frequently. She’ll make you mad and she’ll make you sad and she’ll make you want to quit. If you go into marriage knowing your wife will let you down in a million different ways, you won’t be surprised when she does, and you won’t start looking around for your next best thing. Instead you’ll begin to realize that no flawed human being will ever fulfill you. You’ll also realize that you will never fulfill her. Once we can take an honest look at our own flaws, it becomes a lot easier to give grace to someone else. I know I have been far from a perfect mom, but I hope that I have begun (and will continue) to teach you how to be the kind of man who will make an amazing husband one day. You have an incredible real life example in your dad and if you grow up to be like him, I know your future wife will be one blessed woman.